1) Aren’t you going to get bored? 2) How will you eat?? Actually, one of my best friends told me that I won’t miss any of those Toronto restaurants because Moncton’s Calactus is all I really need. Exaggerated, yes. But still not that far from the truth. I’ve been blogging about this place for years now. It’s my favourite restaurant. Ever. And all right here in my hometown. I first started going to Calactus over a decade ago when it was in a small old house on Mountain Road. 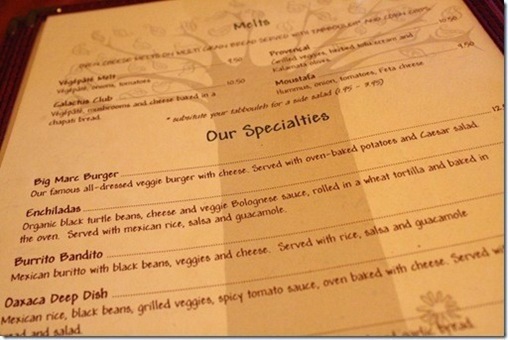 It was around the time my family first started eating vegetarian, and this vegetarian/vegan restaurant helped introduce a whole new style of eating to me. 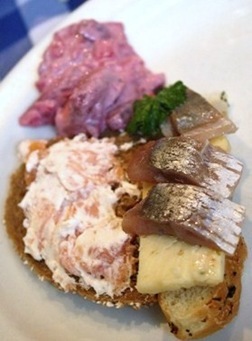 But the even better thing about this restaurant, is that they are more than just one standout dish. Everything is good. 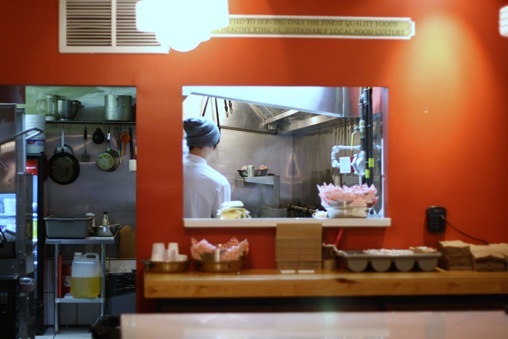 All house made, fresh, flavourful. The kind of meal that doesn’t weigh you down, but leaves you feeling healthily satisfied. Like with they’re Burrito Bandito. Or their extravaganza pizza with tomato sauce, veggie pepperoni, falafel, red onion, green pepper and cheese. Along with a beet and goat cheese salad. I have yet to try their pakoras, but their munchables are amazing. 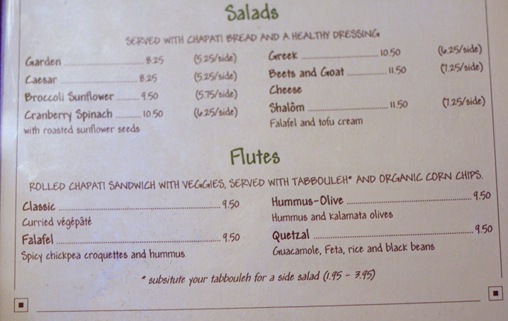 The Thousand and One Nights with chapati bread, feta cheese and olives, falafels, hummus, tofu cream and veggie sticks. Their falafels are the bestest. Perfectly seasoned, crunchy on the outside, soft in the middle, without being greasy. Their tofu cream still alludes me. They put it on a lot of their dishes. Like a garlicky tofu hummus or tzatziki of sorts. My latest visit to Calactus was on Saturday for lunch and my midday cravings wanted something rolled up in bread. I went with a “Flute” which is essentially a wrap. Falafel flavour, because as I said, their falafel is out of this world. With sprouts, lettuce, red onion, tomato, and a drizzle of that savoury tofu cream. My oh my it was good! Their house made chapati bread never ceases to amaze me. Always so soft and fluffy. A million times better than the usual flour tortilla. 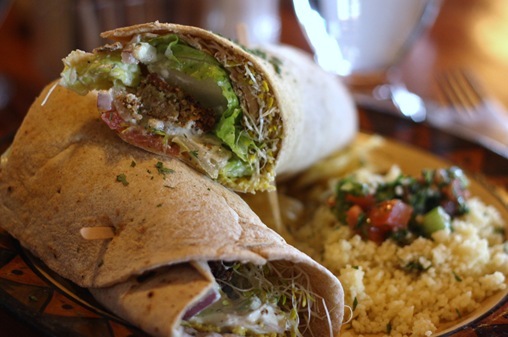 The tabbouleh is something to write home about as well. Rather than being pre-mixed, it’s couscous with the dressed parsley and tomatoes dolloped on top. Tastes almost like a bruschetta on couscous. 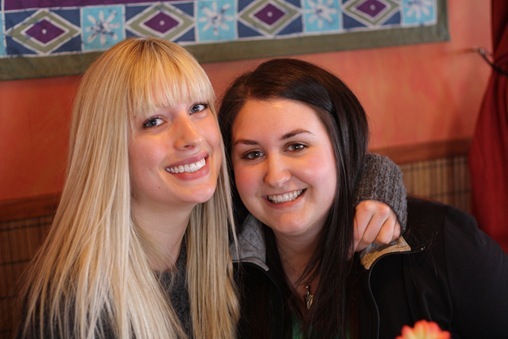 Then of course there’s Christie and Tiffany. My Calactus lunch-mates on Saturday. 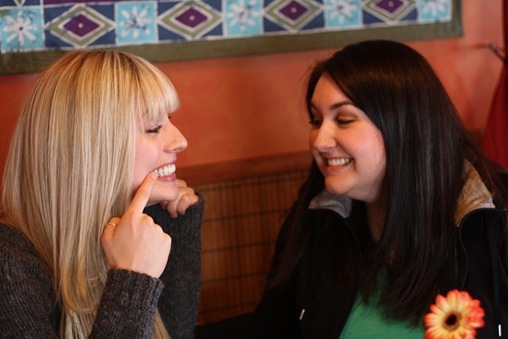 We’ve lunched manymany times together over the ooohhh 20 years (?) we’ve known each other. They’re both living back at home now too. So the three of us live just down the street from each other like we did growing up! Except you know, with a few extra stories to tell from along the way. It’s no secret I’m a tad obsessive about brunch. All my life, breakfast and the foods that go with have been one of my favourite parts of the day. Now, I’m the type of person who needs to eat the second I open my eyes in the morning. Before moving to Toronto I hated eating out for breakfast because I’d feel sick from being so hungry in the morning. I couldn’t wait. Toronto is a big city filled with tons of restaurants. Ten thousand to be exact. Eating at every place that serves brunch would probably be a decade’s worth of work. And a solid 30 lbs. While I didn’t have the chance to try every place while I was there, I do like to think I got to try some of the best. Places known around the city as well as some of the lesser known gems. I haven’t done this by myself either. For you, dear reader, have been along for the ride the whole time! Here with me as I write about my adventures brunching around the city. People always ask me what my favourite places are or how they shape up against one another. It is with this that I bring you my Top 5 Toronto Brunches. Home of the best pancake I ever ate. I was so awed the first time eating it, that in a rare occurrence I went back a second time and ordered the exact same thing. A thick oatmeal buttermilk pancake topped with something different every time. It’s like the cornbread of pancakes, made with hearty oatmeal in a thick skillet. Mitzi’s on College is a cool little spot in Little Italy. Bonus points for having a waiting room instead of forcing hungry brunchers to line up out the door on weekends. They also had the best coffee of any brunch place. Not to mention, an outstanding menu outside of the famous pancake. Located on the cusp of Leslieville and the Riverdale District, Bonjour Brioche is mainly a bakery that fills to the brim with brunchers on the weekend. I came here with my sister who thankfully wanted to split something sweet and savoury. The best of both worlds! We split a croque madam made with toasted brioche, ham, gruyere and a fried egg. The bread was obviously the best part. The real reason why this place captures the number two spot is the french toast. Hands down, the best I’ve ever had. Made with day old pastries. Every person gets a different kind of french toast based on whatever they have around. 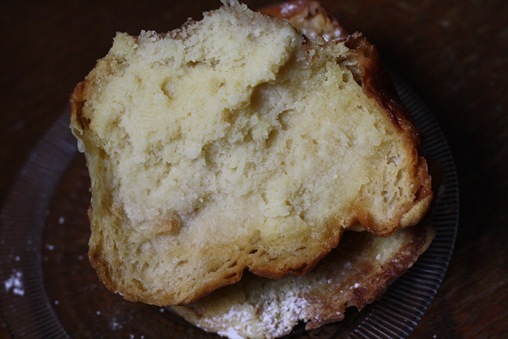 We happened to get some kind of flaky chocolate bread. Soaked in eggs and topped with maple syrup, it was even better than bread pudding. Another Leslieville location. Not surprising, seeing as my neighbourhood in Toronto had the highest brunch-per-person ratio. Honestly, Toast was not originally on my brunch radar. But my roommate seemed pretty excited to try it out and I’m never one to turn down brunch. The place was super cute, sort of like a “classy but relaxed” pub vibe. I ordered the Monte Cristo, with shaved black forest ham and Swiss cheese on challah. It came with a potato hash instead of the usual home fries, which I loved! School was an afterthought before leaving Toronto. I’m so glad I made it there! Themed to remind you of all aspects of going to school, right down to the menu that comes on looseleaf. It’s in a brick institutional building on the outskirts of Liberty Village. It’s expensive, and we waited for a long time to both be seated and served. But in the end, it was still worth it. The menu is divided into sweet & savoury, featuring tons of original french toast, pancake and eggs benedict ideas. I ended up with the Spiced Benni on a Cheddar Chive biscuit. Even though I don’t like hollandaise, I still enjoyed the spicy kind that came with. The best part though was the biscuit the benni came on. Perfectly soft and spicy without falling apart under the runny eggs. Bonus points to School for also making a mean Nutella Scone. This was one of my first places to brunch in Toronto, as recommended my by sister at the time. I later came to know Free Times on College & Spadina as a bar. But I continued to yammer on about their unique brunch to anyone who’d listen every time we were there. 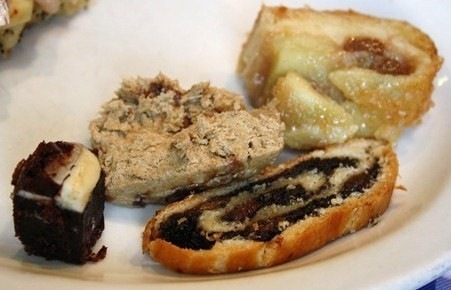 Featuring live Klezmer music, Free Times offers up a “traditional Jewish brunch” buffet on Sundays. It’s not cheap, but worth it once just for the experience. 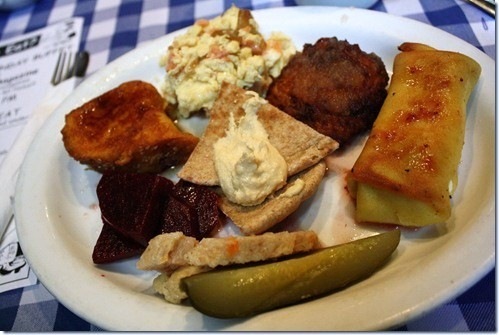 I tried lots from the buffet, including challah french toast, smoked salmon scrambled eggs, potato latkes with apple sauce, blintzes, pickles and beets. And what’s breakfast without dessert? Years from now when I look back on my time in Toronto, I will always fondly remember the time I spent eating brunch. Researching brunch. Discussing brunch. And basically just loving and living through some of the best food the city has to offer. Even though I tout a “healthy lifestyle” on this blog, I think letting go and truly enjoying the food in that city was probably one of the healthiest things I’ve ever done. Okay, and it was pretty damn fun too. All in the name of research, right? I need to get another surgery in about six months to take out that bottom screw. They put a big one in there to make sure it held, but it will hit my other bone once I’m able to move my arm again. 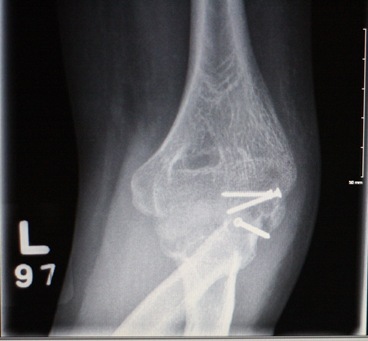 To quote my surgeon: “Your elbow is holding together well given the likelihood it could fall apart.” Awesome. I’ll have to continue regular follow-ups with a surgeon in Moncton to ensure that it indeed does not fall apart. I also need to step up the physio and work on moving it more. Which I’ve only been doing gently so far because it’s so painful to do. Overall, I didn’t leave the appointment feeling great. But there’s also nothing I can do to make it magically better. Just gotta wait it out I guess! Anyways, in order to start fresh in New Brunswick next week (!!!) 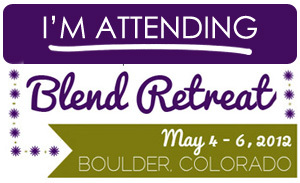 I have a few more “bloggables” from the Tee Dot I’m going to handily wrap up all in one post. Three places: A burger place, a bakery, and a Holy experience. Let’s get started, shall we? You may remember back in December when my roommie and I checked out The Burger’s Priest. 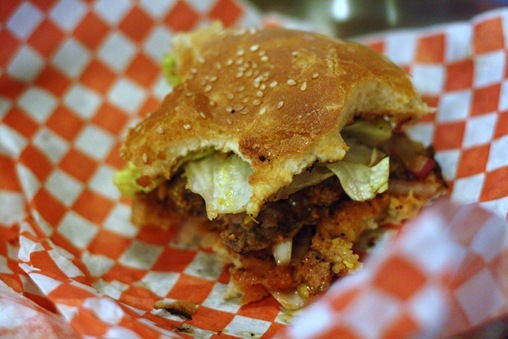 A teeny tiny burger joint in the East End that has burger enthusiasts foaming at the mouth. I liked it a lot, but I didn’t love it. 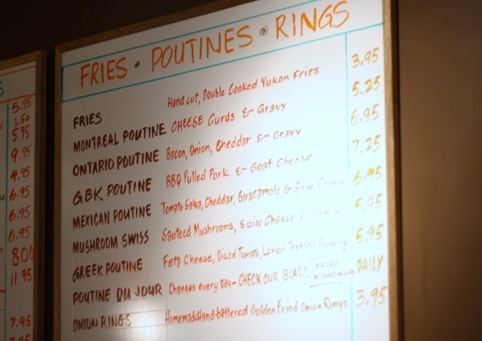 I feel like I still needed to find “my” burger in Toronto. 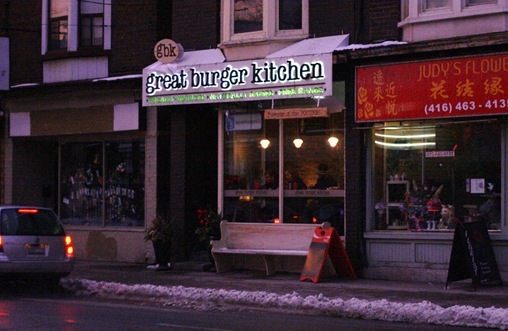 Great Burger Kitchen at Gerrard and Jones is supposedly also one of the best. Megan and I came here on a whim one Sunday evening because that’s what we did when we had spare time and no recipes to be made at home. We may have gone home after and watched Rockstar Supernova circa 2006. We may have re-watched the whole Rockstar INXS series at one point too. Watching old reality TV shows is fun. You feel like you’re from the future. Anyways, GBK. It looked like they had great poutines. I can’t confirm this as I was after the meat only. I had the classic burger which comes with lettuce, tomato, red onion, ketchup, mustard and pickles. 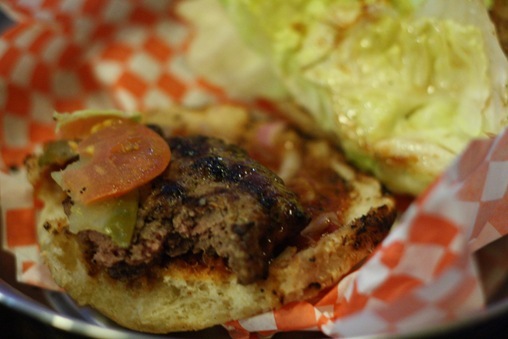 Made with all natural Ontario beef served on a bun from the well known local joint Brick Street Bakery. 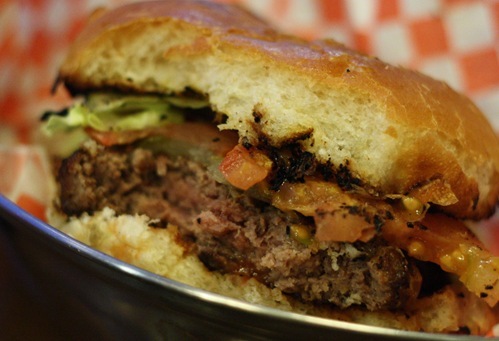 First, the patty. Flavour-wise it was all there. 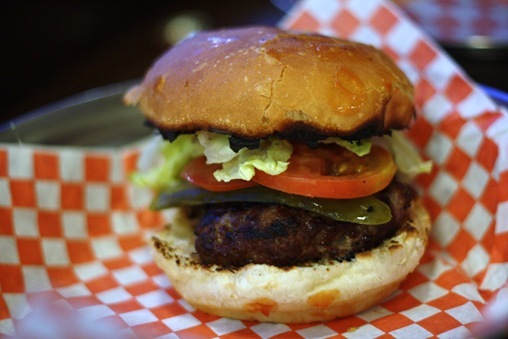 I loved how thick it was, compared to the thin and salty patties at The Burger’s Priest. It was however a touch too dry for my tastes. Also, the patty-to-bun ratio borderlines absurd. Don’t get me wrong, I loved the bun. 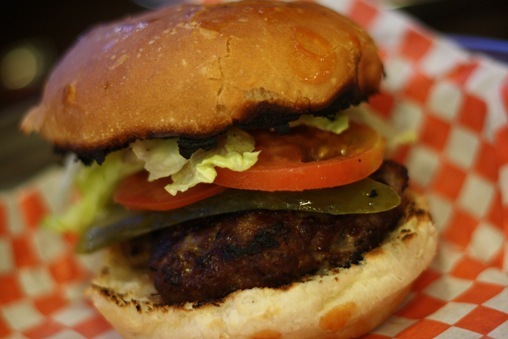 Actually, it was probably the best hamburger bun I’ve ever had. White, fluffy, but sturdy enough not to crumble in the presence of the burger. But it was twice the size of the patty. I’d say half my bites were easily bun only and contained no meat. FYI: eating giant hamburgers with one hand is tricky business. I could probably teach a class on eating with one hand by this point. Right. So y’all know I have this undeterred fondness for pastry wrapped in butter. 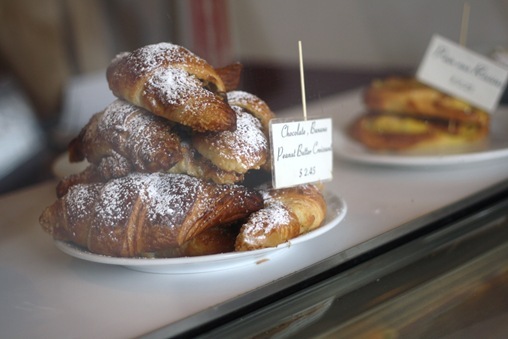 I never specifically set out to find the best croissant in Toronto. 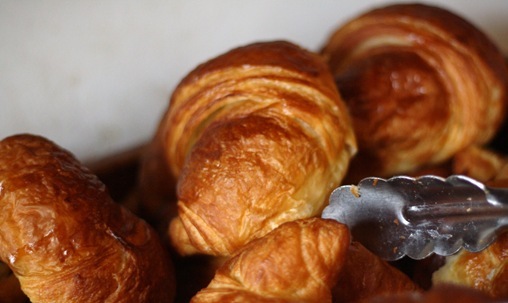 Amazing croissants are the kind of thing that find you, ya know? 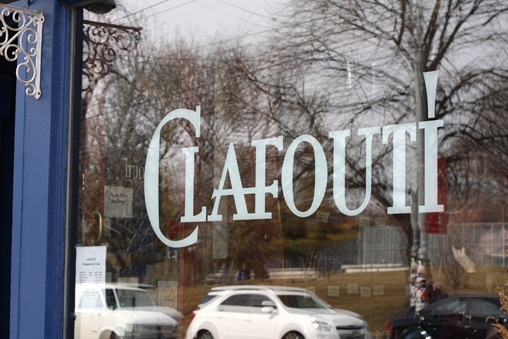 But again, in my intense foodie research, I found that Clafouti on Queen West was consistently praised for their croissants. I walked in on a late Sunday morning after brunch not sure of what goodies would be left. Roommie Megan snatched up the Chocolate Banana Peanut Butter Croissant. Ohyes. But I had my eyes on something else. 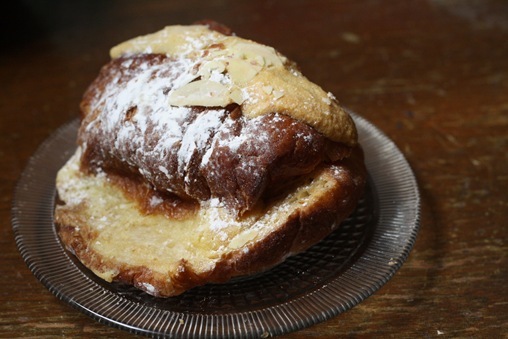 An almond croissant. 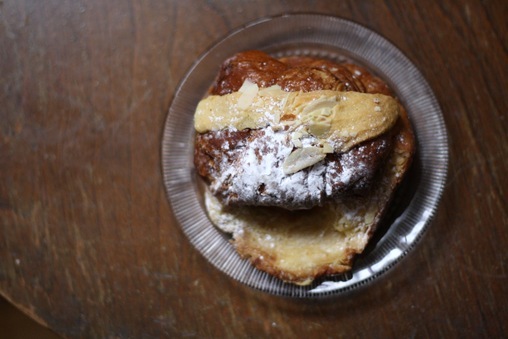 I feel like apart from chocolate and butter, almond croissants are about as “classic” as you can get. And I’ve never had one! I tucked it away in my purse, having just scarfed down brunch and all, and gingerly pulled it out come dinnertime. Okay, I only made it till 4pm. 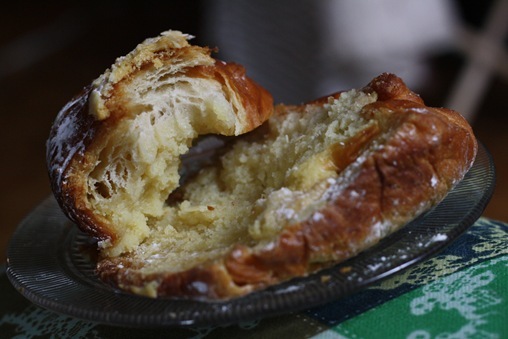 The croissant easily broke in half, each side coated with a sweet almond paste. Nothing like the marzipan found in chocolates. This was a like a nutty, sugary, dreamy spread. The centre of the croissant was soft, but dense! And a little tough on the outsides. I’m not sure if all almond croissants are this thick. I’m better versed in the airy, flaky, greasy sorts. Overall though, it was a damn good croissant. I polished it off with an apple and called it a balanced meal. Remember when my sister took me to Le Gourmand at Queen & Spadina? 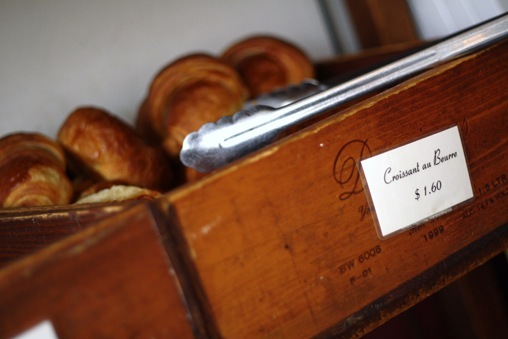 She actually brought me there for croissants, which I will say were quite good. But I spotted these trays of cookies and knew they were mine. 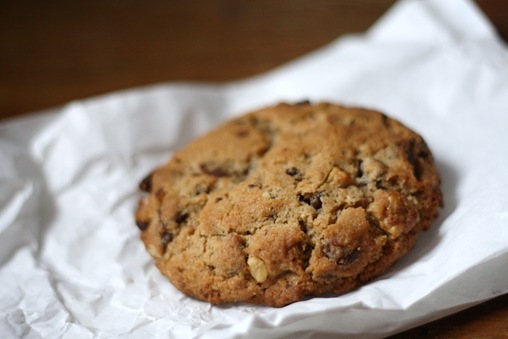 Walking past there the other day I popped in to get the cookie that’s been calling my name ever since. They only had chocolate chip and chocolate chip walnut. I went with the latter. I brought it home and immediately broke a piece off to taste. 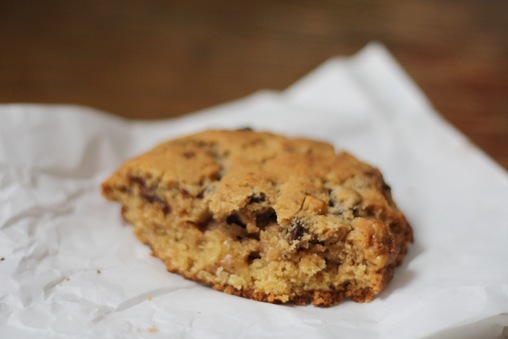 An inch thick and almost the size of my hand, one cookie is actually equal to about four. It was SO soft. 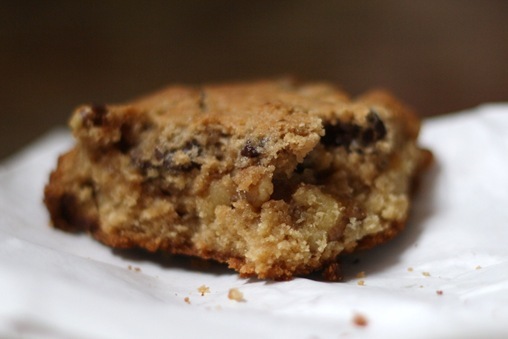 With the perfect sized little chocolate chips. I thought about it for the rest of the night. The next morning I took another piece at zapped it in the microwave. It was at that point I melted into a giant puddle in the middle of my kitchen floor. Just like Alex Mack. I was in confectionary heaven. So that ends my torrid tales of foodie adventures in Toronto. Just in time too, because my last pair of jeans are starting to get tight. Now it’s time shape up and get cooking in my brand new kitchen. Which you’ll have to wait till Sunday to see. Have a great weekend!